Experience the benefits of a cloud-based contact center with Amazon Connect. A sponsored AWS Bootcamp is an opportunity to dive deep into the benefits of deploying the Amazon Connect cloud-based contact center solution. The goal of this course is to provide you with a complete understanding of the core concepts related to the provisioning, configuration and management of Amazon Connect. This course will equip you with a general knowledge of the various AWS services leveraged by Amazon Connect as well as knowledge of available integration methods to CRM, WFM and execution of Lambda functions in order to create call-flow integrations. A two-day event is planned. Day One takes place in a classroom setting featuring lectures and demonstrations with a hands-on approach. Day Two is a free-form ‘Builders-Day’ enabling you to create a use-case Call Center experience that is relevant to your business. The goal of this course is to give you a thorough understanding of the core-concepts in configuring and managing Amazon Connect within your own contact center. Attendees will need to complete a few tasks to ensure a successful experience. Please review and complete the prerequisites prior to your arrival for the course. 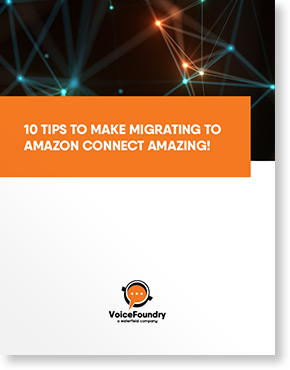 The VoiceFoundry and Amazon Web Services team will take you through this two-day course helping you gain the core concept knowledge for provisioning and configurating Amazon Connect. This team of specialists have been working with businesses to quickly drive changes in contact centers looking to leverage the power of Amazon Connect. VoiceFoundry is passionate about customer experience. We specialize in the delivery of Amazon Connect cloud-based enterprise contact center solutions and are uniquely focused on helping businesses improve customer engagement, while maximizing the benefits of the cloud. Our team is equipped with best practices and a methodology to make moving to Amazon Connect a great experience. We are focused on understanding your business model and how you envision your customer experience so that we can deliver the right solutions and applications to meet your requirements. We have the right mix of expert knowledge and innovative products with Amazon Web Services to make your vision a reality. Check in will be on the 2nd floor. Visitors need to pull a ticket to enter the parking structure, which is located right next to the building address. Visitors can park in designated visitor parking stalls, but if those are not vacant, they can park in any parking stall not marked “Reserved”. Amazon Development Center (Netherlands) B.V.